Occurrence: Celery is consumed as raw or as a cooked vegetable. Celery spice is used in many processed foods such as spice mixtures, soups, broths and salad dressings. More information..
Allergy to celery is associated with allergy to birch pollen and also allergy to mugwort pollen. The most common symptom is oral allergy syndrome as for several other pollen related food allergies. However, serious reactions to celery such as anaphylaxis have been reported. Raw celery, cooked celery and celery spice have all caused reactions although some individuals may not react to cooked celery. Thus celery and products thereof are listed in annex IIIa of the EU directive on labelling of pre-packaged foods. In addition to the additional information on celery, some data on celery is reported in the summary on spices summary on spices. Allergy to celery tuber (celeriac), a member of the Apiaceae family, belongs to the most frequent pollen-related food allergies in some European countries such as Switzerland, France, or Germany. Celery is consumed as raw or cooked vegetable. Severe allergic reactions to celery are mainly observed after ingestion of raw celery but can also occur after intake of foods containing technologically processed or heated celery roots. This is particularly important since dried powder from celery roots is used as a cheap spicing ingredient in many processed foods such as spice mixtures, soups, broths and salad dressings. The allergenicity of celery spice has been shown for patients with known allergy to raw celery in our recent food challenge studies. Thus, commercially used celery powder is not safe for patients who are allergic to raw celery. Furthermore, the allergenic potential of celery was sustained for some patients even after extensive thermal treatment (>60min, at a temperature of 100°C), suggesting a high heat resistance of some of the celery allergens. Local reactions in the mouth such as itching, but also systemic reactions affecting the skin, the nose and lungs and the stomach or severe life threatening reactions (anaphylaxis) have been observed upon ingestion of celery. Compared to allergic reactions to other fresh vegetables the course of celery allergy is often more severe. During challenge studies with celery, 50% of patients developed local reactions in the mouth and 50% systemic reactions. In a number of patients systemic symptoms were even observed after contact of celery with the mouth without actual ingestion of the allergenic food. The minimal dose eliciting allergic symptoms (threshold doses) has not been determined so far. However, 48% of patients undergoing oral provocations with celery developed allergic symptoms at a dose of 700 mg.
Allergy to celery is frequently associated with birch and or mugwort pollinosis. Therefore, the term birch-mugwort-celery-syndrome has been established. Birch pollen and celery allergy are closely related in Central Europe, while celery allergy develops more frequently in patients with sensitisation to mugwort pollen in Southern Europe. Moreover, allergy to carrot and spices is highly associated to celery allergy. Celery allergic patients may develop a spice allergy, in particular to members of the Apiaceae family such as parsley, coriander, cumin, aniseed, but also to bell pepper and pepper. Allergenicity of stick celery and celery seed, which are used for spicing and for aroma production have not been scientifically evaluated in challenge studies so far. In Switzerland about 40% of patients with food allergy are sensitized to celery root, and severe anaphylactic reactions have been reported. In France, 30% of severe allergic reactions to foods were thought to be due to celery according to patients’ history. For diagnosis skin testing with celery extract may be performed, or blood samples may be measured. Up to 85% of patients with celery allergy depict positive results in these tests. If raw celery is used for skin testing 96 % of celery allergic patients are skin test-positive. Patients with allergy to birch or mugwort pollen, however, may show positive skin test/in vitro results to celery without being affected by allergic symptoms after celery consumption. Thus, positive test results have to be interpreted on the background of a positive case history and/or oral exposure tests. Due to its high allergenic potency celery is included into the list of foods for mandatory labelling according to the revised EU Labelling Directive 2003/89/EG. The larger image to the top right shows celery stalk, however, allergy to celeriac, which is a variety grown as a root vegetable (see smaller image) seems to be more common. The variety Apium Graveolens Var. Rapaceum http://edis.ifas.ufl.edu/BODY_MV043, is grown in the USA and variety Prinz has been used in European studies of celery allergy. Celery and products thereof are listed in annex IIIa of the EU directive on labelling of foods. Bublin et al (2003)  reported oral allergy syndrome (OAS) in 3 patients, one with angioedema and 4 with angioedema and urticaria with celery (all also reacted to pollens). Ballmer-Weber et al. (2000)  reported that 16 patients complained of OAS, 9 urticaria or flush, 6 angioedema, and 2 reported a palmoplantar itch. Nausea was experienced by 1 patient, heartburn on consumption of celery was experienced by 2 patients, and flatulence and abdominal cramps were mentioned in 3 patients. One patient suffered coughing, and another had slight dyspnea. Conjunctivitis or rhinitis was reported by 4 patients. One patient experienced rhinoconjunctivitis only when preparing, but not after eating, raw celery. Novembre et al. (1998)  reported a single case of anaphylaxis due to celery in a study of anaphylactic reactions in children in Florence 1994-1998. Jankiewicz et al. (1996)  report that 27/29 patients complained of OAS on consumption of celery. Severe gasteroinestinal symptoms such as diarrheoa and vomiting were reported by 4 patients (14%); asthma by 4 patients(14%); Quincke oedema by 2 patients (7%)and urticaria by 1 patient (3.5%). Strickler et al. (1986)  reported 2 cases of anaphylaxis to celery in a study of idiopathic anaphylaxis. Ballmer-Weber et al. (2000)  includes a survey of symptoms reported by several earlier studies, often in German or French. It is notable that the percentage of severe reactions such as anaphylaxis varies sharply with 3/6 studies reporting 15-20% and the others >3%. Jankiewicz et al. (1996)  also notes a difference between celery allergy in German and Swiss patients with the German patients suffering milder symptoms. Ballmer-Weber et al. (2000)  used commercial celery extracts (Stallergènes and Allergopharma), their own extract and raw celery (root or stalk) for prick-prick tests. The celery extract was made from raw celery root, frozen in liquid nitrogen and homogenised, by extracting with shaking for 4 hours at 4° C with 10 mM sodium/potassium phosphate (pH 7.4), 3 mM KCl and 140 mM NaCl. This was paper filtered and centrifuged at 20,000xg for 30 minutes, then passed through a cellulose acetate filter of pore size 0.45 µm (Sartorius). The filtrate was dialysed overnight against distilled water, freeze-dried and kept at -20° C until use. Hoffmann-Sommergruber et al. (1999)  used recombinant Api g 1 in addition to commercial celery extracts. Jankiewicz et al. (1996)  cut the food samples into small pieces and homogenised them in acetone/dry ice at -60 to -65° C. Thre precipitates were washed twice with acetone and once with acetone/diethyl ether (1:1 v/v) at the same temperature, filtered and freeze dried. Protein extracts were made with 2 g of acetone powder and 30 ml. of 10 mM potassium phosphate buffer (pH 7.4) with 150 mM NaCl, filtered, centrifuged and freeze-dried. Raw and microwave cooked (30 minutes at 100° C) celery was used. Histamine was the positive control in Stricker et al. (1986) . A positive wheal was defined as >5mm diameter. Jankiewicz et al. (1996)  determined the optimal concentration of celery extract by testing 5 patients known to be sensitised. Histamine was the positive control and a positive wheal was defined as >3mm diameter without a response from the negative control (saline). Hoffmann-Sommergruber et al. (1999)  used 0.9% (w/v) NaCl and 0.1% (w/v) histamine dihydrochloride solution as negative and positive controls. A wheal >3mm diameter was taken as positive. Stricker et al. (1986)  tested 102 patients. Jankiewicz et al. (1996)  tested two groups: 167 patients sensitised to at least one pollen and a plant food and 407 patients with suspected atopy. Hoffmann-Sommergruber et al. (1999)  tested a group of 24 patients from Switzerland and 12 patients from Montpellier (France) and 5 controls. Ballmer-Weber et al. (2000)  tested 32 patients. Stricker et al. (1986)  tested 102 patients who had suffered idiopathic anaphylaxis (such as reactions to an unknown allergen) with a battery of 79 skin tests. 4 were positive to celery and this was clinically relevant in 2 cases. Jankiewicz et al. (1996)  compared the results of SPT with EAST analysis of sera from 46/167 patients sensitised to at least one pollen and a plant food and also performed SPT on a second group of 407 patients with suspected atopy. 38/46 patients in group 1 had a positive SPT with at least one celery extract (27/38 exclusively with raw celery extract, 4/38 with only heated celery extract and 7/38 with both). The EAST and SPT were in striking diagreement. Only 17/34 SPT positive patients were EAST positive to the same extract. However, the 6 patients who reported clinical reaction to celery all had either a positive SPT or EAST. The 407 patients of group 2 included 157 with positive SPT to at least one pollen (103/157 to birch, 69/157 to mugwort and 98/157 to grass pollen). 19/157 were SPT positive to celery and only 5 of these reported symptoms on ingesting celery. Hoffmann-Sommergruber et al. (1999)  reported that all 24 Swiss patients with celery allergy gave positive SPT by prick-to-prick tests with celery, commercial celery extract and rApi g 1 whereas all nonallergic control subjects were negative. However, while 11/12 French patients reacted to raw celery, only 3 reacted to commercial extract and only 2 to rApi g 1. All 12 French patients gave positive SPT to mugwort. Ballmer-Weber et al. (2000)  report positive SPT for 21/22 patients with positive DBPCFC to celery and 6/8 with negative using a locally prepared extract. Using a prick-prick test with raw celery, 21/22 DBPCFC positive subjects were SPT positive and 8/8 DBPCFC negatives were negative. With two commercial extracts, 10/22 and 11/22 were SPT positive and 1/8 and 7/8 were false positives. Vieths et al. (1995)  extracted proteins from celery roots by a low temperature acetone powder method and stored them freeze dried at -20° C. The celery extract was 1100 µg/ml. Breiteneder et al. (1995)  and Hoffmann-Sommergruber et al. (2000)  used the celery extract of Ebner et al. (1995) and purified recombinant Api g 1.0101 and Api g 1.0201. Bublin et al (2003)  used sera from 14 birch pollen, mugwort or celery allergic patients with reactivity to allergens >25 kDa. 8/14 reported reactions against raw or cooked celery. Lüttkopf et al. (2000)  used sera from the 32 patients challenged by Ballmer-Weber et al. (2000)  using DBPCFC. Vieths et al. (1995)  used sera from 38 patients with isolated or combined sensitivity to birch pollen, mugwort pollen and celery. Ebner et al. (1995)  used sera from 20 birch pollen allergic patients. Lüttkopf et al. (2000)  report that sera from 17 of 22 DBPCFC positive patients (77%) were positive in the celery CAP (classes 1-6), with binding to Api g 1 (13/22), cross-reactive carbohydrate determinants (12/22) and Api g 4 (5/22). All of the 22 patients either had a CAP positive for mugwort (73%), birch pollen (91%), or both (64%). Twenty patients had a positive IgE-dependent sensitization to Bet v 1 with CAP classes ranging from 2 to 6; 6 patients were also sensitized to Bet v 2. Sera from 14 of 21 patients (67%) were positive to grass pollen CAP. Vieths et al. (1995)  divided the 38 sera into 5 groups: 7 with positive RAST to birch pollen alone (1-17 PRU/ml); 7 with positive RAST to mugwort pollen alone (1-19 PRU/ml); 8 with positive RAST to both birch pollen (1-66 PRU/ml) and celery (1-7 PRU/ml); 5 with positive RAST to both mugwort pollen (1-38 PRU/ml) and celery (1-3 PRU/ml); 11 sera gave positive RAST to birch pollen (1-77 PRU/ml), mugwort pollen (1-33 PRU/ml) and celery (1-9 PRU/ml). Bublin et al (2003) , Hoffmann-Sommergruber et al. (2000)  and Ebner et al. (1995)  used 1D SDS-PAGE with 12% separating gels. Lüttkopf et al. (2000) , Jankiewicz et al. (1997)  and Vieths et al. (1995)  used 1D SDS-PAGE with 13% separating and 5% stacking gels. Samples were reduced with beta-mercaptoethanol and loaded at 14 µg/cm. Bublin et al (2003)  blotted proteins onto nitrocellulose membranes (Protran BA 85, Schleicher and Schuell, Dassel, Germany). Membranes were cut into strips and blocked in 50 mM sodium phosphate buffer, pH 7.5, with 0.5% (w/v) bovine serum albumin, 0.5% (v/v) Tween 20 and 0.05% (w/v) sodium azide. Strips were incubated with patient's sera (diluted 1:4) overnight at 4°C. Bound IgE was detected by incubating the strips with 1:20 diluted I-labeled anti-human IgE (MALT Allergy System Isotope Reagent, IBL Hamburg, Germany) overnight at room temperature and exposing them to BioMax MS-1 films (Eastman Kodak, Rochester, NY). Lüttkopf et al. (2000)  transferred proteins to nitrocellulose membranes by semidry blotting and blocked twice in 50 mM TRIS/HCl buffer (pH 7.4), which contains 150 mM NaCl and 0.3% (v/v) Tween 20 (TBST buffer). All sera and immunoreagents were diluted in TBST buffer, which contains 0.1% (w/v) BSA. Cut nitrocellulose strips were probed with human sera overnight, which were applied in a final dilution of 1:6.7 (v/v) on blots with celeriac extract and 1:10 (v/v) with recombinant proteins. IgE was revealed with alkaline phosphatase conjugated mouse anti-human IgE (1:1000 (v/v), 4 hours) (PharMingen, San Diego, Calif,) and an alkaline phosphatase–staining kit (Biorad, Munich, Germany). Bublin et al (2003)  report that IgE from pooled sera bound to a range of allergens in celery extract with a dominant pair at 53 and 57 kDa. IgE also bound to purified Api g 5. However, there was no binding to degylcosylated Api g 5 indicating that recognition was towards the carbohydrate determinants. Hoffmann-Sommergruber et al. (2000)  reported that IgE from all 10 sera bound to both rApi g 1.0101 and rApi g 1.0201 as well as to celery extract, which gave additional strong bands. 8/10 sera also bound to rBet v 1a. Inhibition analysis a pool of 4 sera showed that binding to rApi g 1.0201 was reduced by rApi g 1.0101 or rBet v 1a and abolished by native Bet v 1. Breiteneder et al. (1995)  reported that IgE from the 10 sera bound to rApi g 1.0101 and to celery extract. Cross-inhibition studies showed that binding of pooled sera from celery allergic patients to celery extract was inhibited by both rApi g 1 or rBet v 1 but that binding of pooled sera of birch pollen allergic patients to birch pollen was only inhibited by rBet v 1. Ebner et al. (1995)  reported that 17/20 patients' sera displayed IgE binding to celery proteins. Sera from 13 patients recognized a protein of 15 kDa (binding was inhibited by rBet v 1) and sera from 4 patients reacted with a protein of 13 to 14 kDa (binding was inhibited by rBet v 2). Eight patients reacted with allergens in the higher MW range. Vieths et al. (1995)  reported that: the 7 sera from patients sensitised to birch pollen alone showed weak IgE reactivity to celery proteins of 15-16 KDa (a close doublet), 16, 18 and 26 kDa; of the 7 sera from patients sensitised to mugwort pollen alone, 3 had IgE binding celery proteins near 30 kDa, 1 had IgE binding to a protein at 18 kDa, 1 bound to the 15-16 kDa double band and 1 bound proteins near 25 kDa; of the 8 sera from patients sensitised to birch pollen and celery, 6/8 showed IgE binding at 16 kDa, 1 showed IgE binding to masses near 20 kDa and 1 reacted to the 15-16 kDa double band; of the 5 sera sensitised to mugwort pollen and celery, 2 sera bound to the 15-16 kDa double band, 2 bound to proteins of approximately 40 kDa and 1 did not bind; of the sera from patients sensitised to all three allergens, 4/11 sera bound the 16 kDa band, 4/11 bound to the 15-16 kDa double bands and 3 sera bound to many bands in the 25-30 kDa range. 8 sera were tested for inhibition of binding by Bet v 1 and ovalbumin. The 4 binding the 16 kDa band showed complete inhibition with Bet v 1 but the other 4 binding the 15-16 kDa double band did not show inhibition. Ovalbumin did not inhibit binding. The sera binding to the 15-16 kDa double band also bound to purified celery profilin, Api g 4, which gave a similar double band. Food used and oral provocation vehicle:Ballmer-Weber et al. (2000)  used a drink of broccoli, cream, yogurt, salt and water containing either raw celery root or additional cooked brocoli mixed together in a blender. Ballmer-Weber et al. (2002)  used the above recepe with additional variations by adding cooked celery or celery spice. Patients were first required to keep the drink (either placebo or active drink) in their mouths for 1 minute and to spit it out. The amount of drink doubled every 15 minutes, starting with 5 mls (0.7g of raw celery) and then 10, 20 and 40 mls. If there had been no response, the other drink was used. If there were no symptoms from the spit phase, 13, 26, 52 and 104 mls of the drinks were swallowed up to 28.5 g if no earlier response was observed (cooked and celery spice used different doses). Blind:Double blind followed by open if negative (Ballmer-Weber et al. 2000) . The most common response (10/22) was to the 5 mls (0.7g of celery) initially given without swallowing (Ballmer-Weber et al. 2000 ; Ballmer-Weber et al. 2002 ). 10/11 patients showing oral allergy syndrome symptoms experienced symptoms during the spit phase with the remaining OAS response at 13 mls swallowed. Systemic symptoms occured in two patients during the spit phase at 5 mls and 40 mls (5.6g) and on swallowing at 1.9g (2 patients), 13.3g and 28.5g (5 patients). A single patient reacted by rhinoconjunctivitis after handling and inhaling the active drink but not after ingesting it. Ballmer-Weber et al. (2000)  report DBPCFC with 32 subjects of whom 22 gave positive responses. 4 others were DBPCFC negative but positive to an open challenge. The most common response was itch of palate, tongue and lips (oral allergy syndrome, OAS) in 9 patients after the initial 0.7 g dose of celery without swallowing (1/32 suffered OAS, rhinoconjunctivitis, cough, dyspnea). One patient also had OAS after consuming 1.9 g celery but in general swallowing and/or higher doses gave other symptoms including rhinoconjunctivitis, cough, flush, pruritis, angioedema, flatulence, adominal cramps, nausea and urticaria. Ballmer-Weber et al. (2002)  report DBPCFC on 12 additional subjects. 10 challenges used raw celery; 11 used cooked celery (110°C/15 min); 5 used celery spice. Nine patients underwent an open mucosal challenge with four samples of canned celery retorted for different times. All 10 challenges with raw celery were positive and again 6 gave OAS and one OAS, rhinitis, conjunctivitis and dyspnea with a dose of 0.7 g celery and the other 3 responded to 28.5 g with angioedema (2 patients) or flush and vertigo. 6/11 patients responded to cooked celery: 3 with a dose of 0.9 g with OAS, 2 with a dose of 1.8 g with OAS and one with a dose of 34.5 g with flush, pruritus, conjunctivitis and dyspnea. All 5 patients responded to celery spice, 3 with OAS (one had flush and rhinitis) with a dose of 0.16g, one with a dose of 0.32g with OAS, rhinitis, conjunctivitis and angioedema and one with a dose of 5.85g with flush, angioedema and gastrointestinal symptoms. IgE cross-reaction between celery and birch pollen and celery and mugwort pollen have been long established (Wüthrich et al 1990 ; see Caballero and Martin-Esteban, 1998  for a review of early articles). Bauer et al. (1996) suggested that there are allergens common between birch, mugwort and celery. Jankiewicz et al. (1996)  established that the cross-reaction is due to Bet v 1 and profilin homologues (Api g 1 and Api g 4) as well as possible carbohydrate epitopes. More recently, Bublin et al (2003)  has shown the relationship between Art v 1 from mugwort and Api g 5 which displays the carbohydrate epitopes. They showed that Api g 5 did not bind IgE after deglycosylation. As Lüttkopf et al. (2000)  found patients with IgE to cross-reactive carbohydrate and not to other celery allergens, this may be the first clear example of clinically significant IgE binding by carbohydrate. The prevalence of celery allergy seems to be relatively high in central Europe but lower elsewhere. Moneret-Vautrin et al. 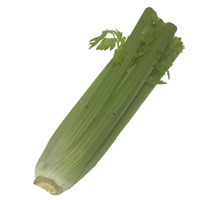 (2004)  found that 5/107 cases of severe anaphylaxis in France in 2002 were due to celery. Zuberbier et al. (2004)  found that 13.6% of positive SPTs in their German population were to celery. Erdmann et al. (2003)  tested the effectiveness of CD63 expression on basophils as a tool for the diagnosis of food allergy and found that it was as more specific than CAP and comparable to SPT over 60 patients including 20 with allergy to celery. Kidd et al. (1983)  was one of the earliest reports of food dependent exercise induced anaphylaxis, FDEIA, with celery causing 3/4 cases. Silverstein et al. (1986)  reported a further case. Shadick et al. (1999)  report a study of FDEIA using a questionaire. They found that 18 respondents (7%) reported that celery caused FDEIA making it one of most common FDEIA associated foods. By contrast Romano et al. (2001)  found that none of their 54 patients reported celery as a likely cause of FDEIA. However, 31/54 were positive by either SPT or CAP to celery. IgE in sera from a single patient was found (Hoffmann-Sommergruber, personal communication) to bind to a Chlorophyll a-b binding protein (Swissprot accession P92919) which is listed as Api g 3 in several databases. This is part of the light harvesting system and may distribute excitation energy between photosystem I & II. Ballmer-Weber B, Bessler M, Hoffmann-Sommergruber K, Vieths S, Wüthrich B.
Jankiewicz A, Aulepp H, Altmann F, Fötisch K, Vieths S.
Serological investigation of 30 celery-allergic patients with particular consideration of the thermal stability of IgE-binding celery allergens. Celery allergy associated with birch and mugwort pollinosis. Lüttkopf D, Ballmer-Weber BK, Wüthrich B, Vieths S.
Celery allergens in patients with positive double-blind-placebo-controlled food challenge. Ballmer-Weber, B., Besler, M., Hoffmann-Sommergruber, K., Vieths, S., Wüthrich, B.
Allergen Data Collection: Celery (Apium graveolens). Ballmer-Weber BK, Hoffmann A, Wuthrich B, Luttkopf D, Pompei C, Wangorsch A, Kastner M, Vieths S.
Association between pollen hypersensitivity and edible vegetable allergy: a review. Bauer L, Ebner C, Hirschwehr R, Wüthrich B, Pichler C, Fritsch R, Scheiner O, Kraft D.
IgE cross-reactivity between birch pollen, mugwort pollen and celery is due to at least three distinct cross-reacting allergens: immunoblot investigation of the birch-mugwort-celery syndrome. Stäger J, Wüthrich B, Johansson SG. Spice allergy in celery-sensitive patients. Bublin M, Radauer C, Wilson IB, Kraft D, Scheiner O, Breiteneder H, Hoffmann-Sommergruber K.
Cross-reactive N-glycans of Api g 5, a high molecular weight glycoprotein allergen from celery, are required for immunoglobulin E binding and activation of effector cells from allergic patients. Novembre E, Cianferoni A, Bernardini R, Mugnaini L, Caffarelli C, Cavagna G, Giovane A, Vierucci A.
Kidd JM 3rd, Cohen SH, Sosman AJ, Fink JN. Silverstein SR, Frommer DA, Dobozin B, Rosen P.
Breiteneder H, Hoffmann-Sommergruber K, O'Riordain G, Susani M, Ahorn H, Ebner C, Kraft D, Scheiner O.
Molecular characterization of Api g 1, the major allergen of celery (Apium graveolens) and its immunological and structural relationships to a group of 17kDa tree pollen allergens. Hoffmann-Sommergruber K, Ferris R, Pec M, Radauer C, O'Riordain G, Laimer Da Camara Machado M, Scheiner O, Breiteneder H.
Characterization of Api g 1.0201, a new member of the Api g 1 family of celery allergens. Hoffmann-Sommergruber K, Demoly P, Crameri R, Breiteneder H, Ebner C, Laimer da Camara Machado M, Blaser K, Ismail C, Scheiner O, Bousquet J, Menz G.
IgE reactivity to Api g 1 a major celery allergen in a Central European population is based on primary sensitization by Bet v 1. Zuberbier T, Edenharter G, Worm M, Ehlers I, Reimann S, Hantke T, Roehr CC, Bergmann KE, Niggemann B.
Erdmann SM, Heussen N, Moll-Slodowy S, Merk HF, Sachs B.
CD63 expression on basophils as a tool for the diagnosis of pollen-associated food allergy: sensitivity and specificity. Shadick NA, Liang MH, Partridge AJ, Bingham C, Wright E, Fossel AH, Sheffer AL. The natural history of exercise-induced anaphylaxis: survey results from a 10-year follow-up study. Neudecker et al. (2003)  analysed the predicted structures of Api g 1.0101 and Api g 1.0201 and compared them to other members of the Bet v 1 family. They note that Api g 1.0101 differs both in the "P-loop" around residue 44 and at the C-terminus and conclude that the "P-loop" region is critical to the different IgE reactivity of api g 1.0101. The mutant K44E showed altered IgE binding to 9 sera with 3 increasing and 3 decreasing. Jankiewicz et al. (1997)  showed that simulated peptic (2 hours) and pancreatic (45 minutes) digestion of a celery extract reduced the IgE reactivity against sera specific for Api g 1, profilin and Api g 5. For an Api g 1 specific sera, protein concentrations for 50% inhibition were 30:34:48:200 µg/ml for raw celery extract, acid treated extract, peptic and pancreatic digested extracts respectively. Jankiewicz et al. (1996)  showed that the immunoreactivity of Api g 1 was highly sensitive to heat, while celery profilin was less sensitive and the carbohydrate determinant survived heating to 100° C for 30 minutes. Nature of main cross-reacting proteins:As a consequence of sequence homology there are cross-reaction with major food allergens from apple (Mal d 1), carrot (Dau c 1) and cherry (Pru a 1) and with pollen allergens from the order Fagales (Bet v 1, Aln g 1, Cor a 1, Car b 1). Api g 1 is also cross-reactive with the birch pollen allergen Bet v 1 and related proteins (from carrot, cherry, apple) as studied by immunoblot, and immunoblot inhibition (Ebner et al 1995 ). Allergen properties & biological function:Api g 1 is regarded as a pathogenesis-related protein due to its sequence identities with several bona fide PR-10 proteins. Its precise function is not known but it may be a steroid binding protein as is Bet v 1 (Markovic-Housley et al., 2003 ). Hoffmann-Sommergruber et al. (2000)  purified recombinant Api g 1.0201 by expression in E. coli as a hexahis-tagged protein. Cells were harvested and lysed. Cell lysates were resuspended in 6 M guanidinium hydrochloride and 0.1M sodium phosphate pH 8.0. Api g 1.0201 was purified by Ni-chelate affinity chromatography. Breiteneder et al. (1995)  purified recombinant Api g 1.0101 without a tag using chromatofocusing and reverse phase HPLC as developed for rBet v 1 (Ferreira et al. 1993 ). Quantitative IgE inhibition experiments with purified recombinant allergens indicate pollen-derived allergens as the sensitizing agents responsible for many forms of plant food allergy. Ferreira FD, Hoffmann-Sommergruber K, Breiteneder H, Pettenburger K, Ebner C, Sommergruber W, Steiner R, Bohle B, Sperr WR, Valent P, Kungl AJ, Breitenbach M, Kraft D, Scheiner O.
Purification and characterization of recombinant Bet v I, the major birch pollen allergen. Immunological equivalence to natural Bet v I.
Allergen epitopes:IgE binding to a mimotope (a synthetic peptide Cys-Ala-Ieu-Ser-Gly-Gly-Tyr-Pro-Val-Cys) was defined by screening a phage display library and inhibited IgE binding to celery tuber profilin (immunoblot). Therefore, it was considered to mimic a common conformational IgE epitope of profilins. (Leitner et al 1998 ). Jankiewicz et al. (1997)  showed that simulated peptic (2 hours) and pancreatic (45 minutes) digestion of a celery extract reduced the IgE reactivity against sera specific for Api g 1, Api g 4 and Api g 5. For an Api g 4 specific sera, protein concentrations for 50% inhibition were 4:14:22:40 µg/ml for raw celery extract, acid treated extract, peptic and pancreatic digested extracts respectively. Nature of main cross-reacting proteins:The protein has sequence similarity identities to birch profilin (Bet v 2): 80%, soybean profilin (Gly m 3) 78%, and barley profilin 75%. Allergen properties & biological function:Api g 4 is a celery profilin, an actin binding protein. The protein has 133 amino acid residues, and a calculated pI of 4.54 (Scheurer et al. 2000) . The pI has been found to be 5.8 - 5.9 by 2D PAGE (Vallier et al 1992) . Allergen purification:Vieths et al. (1995)  report a simplified purification based on van Ree et al. (1992)  and Vallier et al. (1992)  using affinity isolation on poly-L-proline, pLp. The pLp solid phase was made by coupling pLp onto CNBr-activated Sepharose 4B and washed twice with buffer (20 mM immidazole pH 7.5, 150 mM NaCl, 0.5 mM ATP). The celery extract was disolved in the buffer and incubated for 3 hours with the Sepharose beads. The beads were then washed 6 times with the buffer and then proteins were eluted in three fractions with the same buffer containing 6M urea. Out of 17 birch pollen allergic patients with sensitivity to celery: 24% recognized Api g 4 by specific IgE in SDS-PAGE immunoblot (Ebner et al. 1995 ). In another study of 36 mugwort allergic patients with positive RAST to celery, 18 recogised the 15 kDa allergen, Api g 4, in SDS-PAGE immunoblot (Vallier et al. 1988 ) . A third study found that 17% of 60 celery sensitive patients recognized Api g 4 in SDS-PAGE immunoblot (Jankiewicz et al 1996 ) and 23% of a group of 30 celery and birch pollen allergic patients recognized Api g 4 (Jankiewicz et al 1998 ). Of 22 celery allergic patients diagnosed by DBPCFC, 23% recognized Api g 4 on immunoblots (Lüttkopf et al., 2000 ). There is also one report of a patient with allergic rhinitis and atopic dermatitis related to vegetable foods and pollen: inhibition of IgE binding to rye grass profilin by celery extract (RAST) and bound to celery profilin with a polypeptide at 12 kDa recognised by SDS-PAGE immunoblot (van Ree et al., 1992 ). A mimotope defined by phage display inhibits IgE binding to the plant panallergen profilin. Purification and characterization of an allergen from celery immunochemically related to an allergen present in several other plant species. Identfication as a profilin. Cloning of the minor allergen Api g 4 profilin from celery (Apium graveolens) and its cross-reactivity with birch pollen profilin Bet v 2. Vallier P, DeChamp C, Vial O, Deviller P.
A study of allergens in celery with cross-sensitivity to mugwort and birch pollens. Profilin is a cross-reactive allergen in pollen and vegetable foods. Glycosylation is critical for IgE binding as complete deglycosylation removes all IgE binding (Bublin et al. 2003 ). A fucose and xylose glycan coupled to bovine serum albumin inhibited binding to Api g 5. Thus Api g 5 can be identified as the cross-reactive carbohydrate determinant (CCD). Jankiewicz et al. (1997)  showed that simulated peptic (2 hours) and pancreatic (45 minutes) digestion of a celery extract reduced the IgE reactivity against sera specific for Api g 1, Api g 4 and Api g 5. For a CCD specific sera, protein concentrations for 50% inhibition were 3.4:7.0:15:36 µg/ml for raw celery extract, acid treated extract, peptic and pancreatic digested extracts respectively. Nature of main cross-reacting proteins:Api g 5 is bound by IgG raised against Art v 1 from mugwort. Api g 5 is a glycoprotein belonging to a family of flavin adenine dinucleotide (FAD)-containing oxidases (Bublin et al. 2003 ). Homologuous proteins are involved in the plant\Zs response to pathogen attack and abiotic stress. Note that the Api g 5 partial sequence so far available does not seem to be homologous with Art v 1 which is much smaller and has a defensin like and a hydroxyproline-rich domain (Himly et al. 2003 ). However, it is possible that the complete sequence might reveal additional Art v 1 like domains. Allergen purification:Bublin et al (2003)  froze celery tuber pieces in liquid nitrogen and ground them into a powder. Proteins were extracted in 10 mM potassium phosphate buffer, pH 7.4, containing 2% w/v polyvinylpyrilidone, 2mM EDTA, 10 mM diethylthiocarbonate and 3mM sodium azide by shaking overnight at 4°C. The extract was centrifuged (40,000xg for 60 min. at at 4°C) and the supernatant filtered. Ammonium sulfate was added to 40% saturation. The precipiate was collected and disolved in 20 mM Tris/HCl, pH 7.4, and dialysed against this buffer. This was loaded onto Concanavalin A-Sepharose column (Amersham Biosciences) equilibrated with 20 mM Tris/HCl, pH 7.4, with 0.5M NaCl. This was eluted with 0.4M mthyl alpha-D-mannopyranoside in the same buffer. The eluted protein was dialysed against 20 mM Tris/HCl, pH 8.0, and loaded onto a Resource Q ion-exchange column (Amersham Biosciences) and eluted with a linear gradient towards 20 mM Tris/HCl, pH 8.0, with 0.5M NaCl. Fractions binding IgE were located by ELISA and immunoblotting. These are concatenated in the sequence P81943. Marknell DeWitt et al (2006)  have reported that these sequences are homologous to the sequence of the timothy grass pollen allergen Phl p 4. Ganglberger et al. (2000)  note that the two proteins of 55 kDa and 58 kDa have the same N-terminus and the 63 kDa protein has a blocked N-terminus. Heiss et al. (1996) also report that the 60 kDa protein had a blocked N-terminus. Api g 5 appears as a double band (at least) near 60 kDa on the SDS-PAGE and is recognized by IgE from patients which bind >25 kDa proteins. Deglycosylation reduces the observed mass by 12 kDa and removes IgE binding. Ganglberger, E., Radauer, C., Grimm, R., Hoffmann-Sommergruber, K., Breiteneder, H., Scheiner, O., Jensen-Jarolim, E.
N-terminal sequences of high molecular weight allergens from celery tuber. Himly M, Jahn-Schmid B, Dedic A, Kelemen P, Wopfner N, Altmann F, van Ree R, Briza P, Richter K, Ebner C, Ferreira F.
Dewitt AM, Andersson K, Peltre G, Lidholm J.
Cloning, expression and immunological characterization of full-length timothy grass pollen allergen Phl p 4, a berberine bridge enzyme-like protein with homology to celery allergen Api g 5.